Black Friday's done but the Cyber Monday Nintendo deals continue, including on a nice selection of games to load into your handy system. 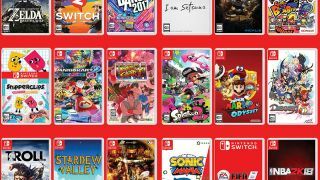 The deals are coming so fast and furious that it's a full-time job keeping up with them, but no worries - we've done the work for you, and grabbed a massive, comprehensive list of all the best Nintendo Switch game deals for Black Friday and compiled it below. Meanwhile, if you need a TV to plug your Switch into, or are looking for any other console or PC related deals, stop by our huge Black Friday game deals hub. We'll be adding and updating throughout this season of frenzied buying, so stay tuned for all the latest sales and deals. Of course, if you need a Nintendo Switch to actually play all these games on, there are some excellent Black Friday Nintendo Switch bundle deals happening right now as well.